I am a frequent DVD ripping user and I have used or tried quite a lot of DVD rippers in the market and use different DVD ripper to do a different job or meet a specific need of DVD ripping. Among those multimedia solution providers, Digiarty’s WinX DVD Ripper Platinum is one of the top. So, when I plan to rip and compress my Bluray collections, I first thought I should try WinXDVD’s programs and wondering does WinXDVD or WinX DVD Ripper Platinum support Bluray disks? 1 Does WinXDVD/MacXDVD Support Bluray? Upon a Google search, I notice there are two Bluray programs called WinX Blu-ray Ripper and WinX Blu-ray Decrypter, however both says “Sorry, the Software is invalid”. I see YouTube reviews of WinX Bluray Ripper and Decrypter back in 2011, so it seems WinXDVD did support Bluray disc a couple of years ago but had stopped developing and there’s no download links available for those two Bluray programs from WinXDVD. And for MacXDVD programs including MacX DVD Ripper Pro and MacX Video Converter Pro, I see no mention of Bluray support either. So, the conclusion is neither WinXDVD nor MacXDVD supports Bluray disc. If you are a WinXDVD/MacXDVD fan, it is really disappointed to see their not supporting Bluray disc. But don’t worry, I’d like to recommend four programs as alternatives to WinXDVD/MacXDVD for you to rip and compress Bluray discs on either Windows or macOS! DVDFab Blu-ray Ripper is a function module of DVDFab 10 and it’s the world-class Blu-ray ripping software that are able to decrypt, rip and convert all types of Blu-ray discs, no matter it is protected or not, Blu-ray ISO files and folder to MP4, MKV, AVI, WMV, iPhone/iPad as well as many other mainstream video and audio formats. And it supports MP4 MKV etc with multiple audio and subtitle tracks with 4K video quality. You can have a trial of DVDFab 10 via the below link. DVDFab Blu-ray Ripper is really rich-in options as you can see. You are able to split your Blu-ray dics by chapters, enable high-quality 2-pass encoding, copy audio or remux the subtitle. DVDFab also supports 2D Bluray to 3D video converting. You are free to set the format, gain and video depth as you like. With the DVDFab Blu-ray Ripper, you can experience the latest and most advanced technologies such as passthrough, HEVC, 4K and more. This software is always updated to support the latest releases with the latest protections. Leawo is one of the most professional multimedia solution provider, focusing on Blu-ray and DVD rippers, copier and creators, video converters/downloaders, recorders etc. And its free Blu-ray player is most user-friendly and powerful Blu-ray player I have ever used. Its Bluray Ripper is a function module of Leawo all-in-one program called Leawo Prof. Media and it is easy yet powerful to rip and convert Bluray discs as well as DVDs, to various video and audio formats like AVI, WMV, MP4, MKV, MP3, M4A, AAC, FLAC etc. It is able to backup your Bluray DVDs to hard drive without quality loss and enjoy the movies anytime anywhere on your iPad/iPhone, Google/Samsung/HTC phones and tablets. With the support of the most recent MKB protection up to v68 at the very moment and BD+ as well as AACS, Leawo Bluray Ripper is reliable for all PC and Mac users as an WinX Bluray Ripper/Decrypter alternative in Blu-ray ripping. And it does decrypting DVDs as well. MakeMKV and Handbrake are always recommended to rip DVDs as they are free doing so. MakeMKV makes an MKV file and Handbrake compress it to MP4. When it comes to Bluray ripping, MakeMKV and Handbrake can still work together to rip and compress Bluray disc to MP4. While Handbrake is always free to compress, MakeMKV costs $50. I have discussed whether MakeMKV and Handbrake to be the best combination for Bluray ripping. The two programs definitely have their limitations but does work for a majority of Bluray discs that I tried to compress to H.264 with two or more subtitle tracks that can turned on or off. AnyMP4 is another top Bluray ripping application that runs on Windows and macOS including Windows 10 and macOS Sierra and High Sierra. It supports various of video formats and devices including MKV, MP4, AVI, WMV, M4V and devices like iPhone/iPad, all kind of Android phones and tablets. It is able to keep multi audio tracks in Bluray ripping. 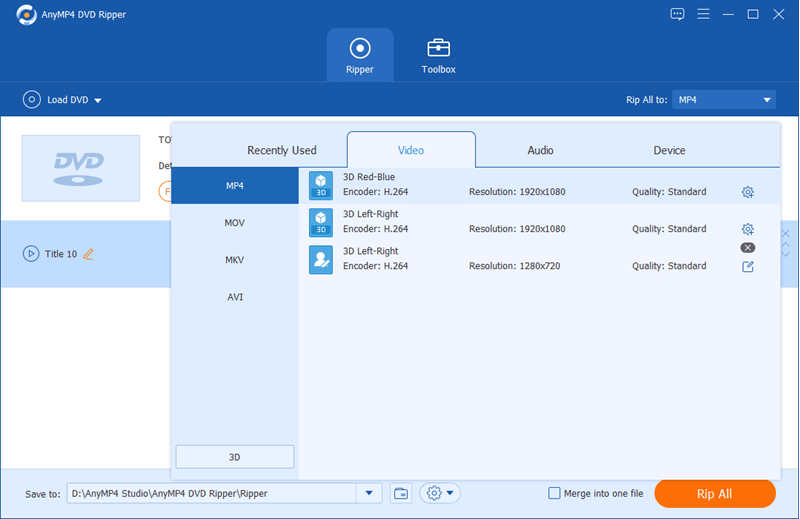 AnyMP4 Bluray Ripper is born for 3D videos and you are able to rip and convert your Bluray disc to 3D formats in almost all video formats and featured 3D formats are MKV, MP4, TS, FLV, AVI. I am sure one will work for your VR headsets. One more thing, I’d always recommend you to allow the program to access Internet as I know Leawo runs updates for its encryption data and AnyMP4 collects to its server to get the passkey for Bluray decrypting. So, which one do you prefer as the WinX Bluray Ripper/Decrypter replacement? Give them a try and find the best alternative! You missed another program from winx dvd called WinX video Converter Deluxe, which I have complaints about. I upgraded from DVD Plat to the deluxe converter because it said that the deluxe could copy blurays. I am trying to back up all my discs, both DVD and Blu-rays. I can’t figure out how to copy the blurays. I click on the video button and then click on the bluray drive but that just opens on a bunch of files and I don’t know which file is the right one and their support said they don’t support Bluray at all and refused to give refund in full! But when I looked at what the software was supposed to do, the wording “blu-ray files” led me to believe it copied blu-ray. I showed it to 4 people, 2 were IT. All agreed it was misleading. I share my experience with everyone I come into contact with and every website I go to advise all from buying their so called Bluray converter. Thanks for the info! Did you try the three programs recommended? They are good alternatives!